I'm really excited to get my first Sunday puzzle in the NYT! I started this puzzle late in 2015, with the concept of each word being a roller coaster track that goes from left to right through a loop. I landed on the word "LOOPER" and thought that could be "LOOP-ER" with a consistent looping at "ER". I initially had several different words in the grid (TIME REVERSAL, INTERAMERICAN CUP, MODERN GERMAN, THEATERGOERS, INTERSPERSED...), but had a really tough time filling it. I worked on the puzzle on-and-off for more than a year before submitting it early in 2017. I really wanted to have MOTHER THERESA in the center position, where CONCERT SERIES ended up, but I couldn't get it to work (there aren't many words with "..HT.." that fit well with the rest). In the end, I liked the 9 theme words I was able to include without too much rough fill. I was really pleased that Will and Joel allowed some science terms that aren't overly common in crosswords, like PRIONS and NANOTUBE. And I owe them a thanks for the small change they made to my homophone clue for 117D to make it chemistry-themed! We've had a couple of puzzles involving looping answers over the past few years, including one with the letters L O O P looping, Coriolis force, and my favorite — one with things that actually loop! The title of SUPER LOOPER gave away the game instantly for me — would have been nice to get something more clever there, allowing for an a-ha moment. I enjoyed many of the finds, especially the ones that were snazzy entries in their own right. 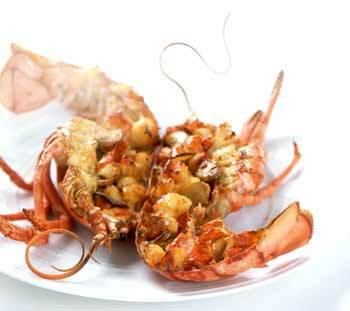 LOBSTER THERMIDOR was particularly nice, as were SPOILER ALERT and ROLE REVERSAL. Great stuff. Not as hot on BEVERAGE ROOM. It was hard enough to parse due to the looping effect, and no smile when I realized it had to be BEVERAGE ROOM … didn't sound like an actual thing. Some research shows that it is an actual term, but that didn't quell my grumblings. Any Sunday puzzle is tough to make, and to introduce more constraints is asking for pain. You might think, what's the big deal, adding just two more fixed squares to each of the theme entries? It's a huge deal, greatly reducing much-needed flexibility. So, not a surprise to get a slew of crossword glue. I stopped counting after I hit 10 dabs of glue, and it felt like it kept on going. Nothing egregious, except maybe OSO, STER, and IF I DO, but so much in aggregate left me with an impression of inelegance. Certainly, reducing the number of theme examples would have helped — eight or even seven would have been perfectly fine for me. I might have even preferred for this to be a weekday puzzle (15x15) with just four themers, as once I figured out what was going on, the concept got repetitive. Overall though, I appreciated the snazzier finds like LOBSTER THERMIDOR, and how Mark worked in some great bonuses that helped keep my attention, like WISHBONE, TAPAS BAR, LOOSEN UP. That's not easy to do with such a constrained puzzle. ADDED NOTE: I completely missed that each loop starts with ER, making for LOOP-ERs! Nice touch, much harder to find good theme answers than I thought. There are 21 rows and 21 columns, with 36 shaded squares, 0 rebus squares, and no cheater squares. Average word length: 5.33, Scrabble score: 545, Scrabble average: 1.46.